This article, originally published in the Milken Institute Review, Fourth Quarter 2002, is included as a chapter in the book, MBA in a Box, published by Random House/Crown, New York, in 2004. Most people approach corporate finance the way scientists deal with problems in the physical world: plug in the right formula and you'll come up with the solution. But as any surgeon will tell you, at the very highest levels, even the most technical pursuit becomes an art. In the same way that artists select from an infinite palette of colors, financiers choose from a broad palette of financial technologies and securities to build the correct capital structure for a business. As conditions change over time, they modify the structure to keep the business strong. There is no optimum capital structure — X percent equity and Y percent debt — that can be applied to different organizations, or to the same corporation at different points of time. Just as you can't make real money by putting a dollar bill on a copying machine, you can't successfully copy the financing technique that once worked for a particular company and transfer it to another time or another company. That's why I have always said that finance is a continuum with infinite variations and hybrids. It takes deep understanding of a company, its environment, and the financing tools available to build sustainable growth that will reward shareholders and create jobs. Building the right capital structure can be as important as managing other parts of a business. This was true for many of the growing companies that I had the opportunity to work with over the past 35 years. Companies like McCaw Cellular, Turner/CNN and TCI went through plenty of ups and downs in their basic businesses. But because they made the right capital-structure decisions, they had the staying power to survive and were later sold for a total of well over $100 billion. Other companies, such as Safeway, Barnes & Noble, MGM Mirage and Occidental Petroleum, built established franchises, but still needed strong balance sheets to stay competitive. This begs the question of what makes a balance sheet strong. Traditional "hard" assets — land, buildings, machinery — can lose value even as less tangible factors — human capital, management information systems, digital distribution networks — strengthen a company's ability to succeed. That kind of disparity between book value and real prospects sometimes contributes to popular myths. Any number of newspapers will tell you that the decade of the 1980s was dominated by debt. In fact, the 1970s was the decade of debt, because the value of equities declined, and the 1980s was the decade of equity. Industrial companies ended the 1980s less leveraged than they entered it. In the mid-1970s, as interest rates were stabilizing and stock market values had declined relative to replacement values, many corporations used debt-oriented securities to extend maturities and finance growth. Because of the higher real replacement values, they often acquired existing assets rather than build from scratch. Thus, during the '70s, debt made up more than half the capital structure of the typical industrial corporation, reversing the trend of the 1960s when equity exceeded debt. By the late 1980s, with equity values for most companies above replacement costs, it made sense to make new investments and to reduce capital risk by selling equity-related securities. During the 1980s, debt relative to book value for many companies was still fairly high. But that wasn't the correct ratio for determining how to finance future growth. The better measure was market-adjusted-debt ratios, a concept developed during my studies in the 1960s and advocated in a series of research papers in the early 1970s. Looking at finance this way, it becomes apparent that leverage can be declining even as debt is increasing. For example, Exxon's equity market value in 1979 was $24 billion and its long-term debt was about $4 billion. During the 1980s, Exxon repurchased more of its common stock than any other public company — some $16 billion worth — and increased its long-term debt to more than $8 billion. Despite this large debt increase, the rise in equity market value to $63 billion was 10 times the added debt. As important as financial ratios are to effective capital-structure decisions, they are only the starting point. There is a broader environment that will affect how the decisions play out over time. 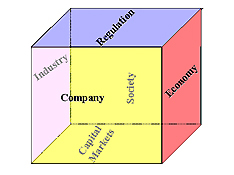 One way to grasp this environment is to visualize the six facets of a simple cube labeled with the words Company, Industry, Capital Markets, Economy, Regulation and Society. 1. The Company. Is the company an established national supermarket chain, a high-tech start-up, or something in between on the continuum of risk? Although there is growing competition in the supermarket industry, grocery companies can usually be leveraged with a higher debt-to-equity ratio because they have more predictable revenue (people always have to eat) and a stable business model. A technology company, on the other hand, should rarely sell debt because of inherent business volatility and competitive risk. In such industries, it's difficult to predict revenue or to say with confidence that cash flow will be sufficient to service the debt. Yet technology companies have often made the mistake of issuing convertible bonds, weakening their balance sheets to the point where they couldn't survive a cyclical business slowdown. If these companies have realistic business plans and qualified management, they should be able to meet their capital needs by selling equity to private investors, venture capitalists and the public. "Qualified management," of course, is a key to determining capital structure. It's not enough to have smart people at the top; you need to understand exactly what their talents are. If, for example, the CEO is skilled in finance, more leverage may be appropriate than for a company headed by a former sales executive. Assuming equivalent financial skills, however, the simple rule of thumb is that risk in capital structure should vary inversely with volatility and risk in the basic business. To paraphrase the late Harold Geneen of ITT, you can make a lot of mistakes in business, but you can't run out of cash. For some companies, even a dollar of debt is too much. This was as true for some airline, aerospace and technology companies of the late 1960s as it was of telecommunications, networking and Internet companies of the late 1990s. Competition. Is it local, regional, national or global? If you lack wide geographic distribution, you may be vulnerable. Concentration and financial strength. A small company about to launch a software product that will compete head to head with Microsoft faces a different challenge than a manufacturer in an industry with less concentration and no companies with strong balance sheets. Cyclicality. For the baby-products industry, cycles take decades to play out; for semiconductors, things can change in a few months. Competitive R&D levels. What percentage of revenue do companies in the industry spend on research and development? What is your risk of being severely hurt if that spending produces a new technology? Barriers to entry. How easily and quickly can new entrants take market share? Volatility. In the 1960s (and again in the 1990s), many technology companies were misfinanced, and ultimately failed, because they didn't adequately consider the ups and downs of the industry. Capacity. New competitors entering the telecommunications industry in the late 1990s built far more capacity than was needed, driving down prices and leaving almost every player with insufficient cash flow to service their debt. Despite this overcapacity and demand that failed to materialize, these companies would have had more staying power if they had put more equity into their capital structures. Quality. Where does the company rank in the quality spectrum of the industry? The effect of a change in customer demand will play out differently across the industry. While a recession might mean a 50% drop in revenue for low-end companies, industry leaders often suffer milder effects. If your competitors are financially strong and your customers count on you to keep them operating, you might need excess liquidity. In the late 1970s, MCI was a tiny company competing against an industry colossus, AT&T, with AAA credit, a strong balance sheet and a 98-percent market share. Facing that kind of competitor, MCI needed to show staying power. By the early 1980s, the company planned to build an advanced network that would require large amounts of capital. Following what was then the largest debt financing in history, company management put an extra $500 million in cash on their balance sheet so that customers, suppliers and investors would know they were financially strong. Over the ensuing years, MCI's growth allowed it to create more than 50,000 jobs for American workers. 3. Capital Markets. A primary management goal should be maximum operational flexibility. This requires close attention both to the type of security used and the timing of its issuance. Generally, companies should build capital structure from the bottom up, selling equity and junior subordinated debt when markets are strong. Just as you'd hold back your highest cards until you need them in a card game, you'll want to reserve the most senior securities at the top of your capital structure for a "rainy day." The time to raise capital is when the market is most receptive, not when you most need the funds. Remember, you're not just raising capital; you're enhancing the company's staying power and increasing its flexibility. 4. The Economy. Changes in the overall economy affect perceptions of individuals and corporations, making them feel more or less confident and willing to spend. A "wealth effect" came into play in the 17-year period between 1983 and 2000 when stocks compounded at almost 15 percent a year, not counting dividends. That contrasts sharply with the one-percent annual growth before dividends in the 17 years from 1965 to 1982. These cycles affect the optimum capital structure for any company. In addition to the overall economic cycle, there are always sub-economies that follow their own rhythms. Every month, some industries are on the way up while others are declining. Every day, no matter what the broad stock market indicators say, some stocks hit new highs and others new lows. Sometimes, the disparity is driven by regional variations, such as the slump in the "oil patch" states in the early 1980s; sometimes, the driver is demography, which has created growing demand in such industries as pharmaceutical products and financial services as baby boomers age; and sometimes a specific event will send an industry up or down - the end of the Cold War drove down defense stocks, but they moved up following the 9/11 terrorist attacks. 5. Regulation. No company and no industry can operate independently from regulation. In 1993, a new government health-plan proposal would have led to sweeping changes in the pharmaceutical industry, including what some feared would be regulation of rates of return on investments. This would have had a major impact on an industry in which it can take 14 years to bring a new drug to market. The ten largest companies in the industry lost a staggering $70 billion in market capitalization in only 14 months because of the mere possibility of regulated rates of return. Tragically, but logically, pharmaceutical companies responded by cutting research-and-development budgets in a necessary realignment of risk and return. While we'll never be able to measure what medical breakthroughs may have been lost or delayed, one thing is certain: corporate managements can never afford to ignore regulatory developments. In the late 1980s, Congress passed the Financial Institutions Reform, Recovery and Enforcement Act (FIRREA), which typified a brief period of over-regulation that targeted insurance companies, bondholders, banks and other lenders. Well-meaning but ill-advised, FIRREA banned investments by savings and loan institutions in non-investment-grade companies and forced the S&Ls to sell existing loans that had been made to these enterprises — the very companies that create all the new jobs in America. (Over the last 30 years, more than 100 percent of jobs created in the U.S. have come from small and medium-sized companies that don't qualify for an "investment-grade" credit rating. During the same period, the 800 or so investment-grade companies have actually shed a net four million workers while smaller companies created 62 million jobs.) At the time, there was only a handful of investment-grade companies headed or controlled by African Americans, Hispanics, women or unions. Thus, as recently as the late 20th century, the Congress of the United States effectively, albeit unknowingly, said it was illegal to provide capital to businesses headed by minorities and women or to any company that would create jobs. It was OK to make a mortgage loan that would build a building; but you couldn't finance the company that provided jobs for the people inside the building. That's why I called FIRREA and similar regulatory acts "neutron legislation" - like a neutron bomb, they left buildings standing but eliminated the people, or at least their jobs. Because only a handful of our 50 states have more than a few dozen "investment-grade" companies (some states have no such companies), Congress effectively redlined most regions of the country, reducing asset values and employment. 6. Society. This is in some ways the most important facet of the cube. Businesses always need to understand which way society is going on the key issues that affect their products. If you are perceived as part of the solution to current social concerns, then you're well positioned. But if you're part of the problem, you may want to exit the business. At the very least, you'll need a more conservative financial structure. As recently as 1986, the most valuable brand name in the world was Marlboro. Yet its value was about to begin a long and steady decline that can be attributed almost entirely to changes in our society and its view of smoking as a social rite. These changes did not come without plenty of warning. As early as 1939, the Surgeon General of the United States suggested that smoking could be bad for your health; and a later Surgeon General's report in the 1960s concluded that there was a direct link between smoking and cancer. Congressional hearings in the 1990s raked tobacco-company executives over the political coals and encouraged massive lawsuits against the industry. Just as smoking became an epidemic in the 20th century, today a new epidemic - obesity - presents a growing threat to the health of our nation. More than half of Americans are overweight or obese, which leads to some 300,000 unnecessary deaths each year and costs our economy more than $100 billion. In much the same way that tobacco marketers were eventually held responsible for promoting unhealthful products, the new epidemic will undoubtedly encourage litigation in search of judgments against those purveying unhealthy food. Whether or not this is justified is a matter for the courts. The key for investors and corporate managers is risk analysis. Where is society heading in the 21st century? The two largest sectors of the U.S. economy — health care and education — are poised to expand and become an even larger share of gross domestic product. In 1950, there was not a single health care or pharmaceutical company among the 100 corporations with the largest market capitalizations. Today, 17 of the top 100 companies in the world, including five of the top 15, are pharmaceutical, biotechnology or medical products companies. Health care already accounts for about 15 percent of U.S. GDP and its slice of the national economic pie continues to grow. Education may well follow a similar path. No education company is currently listed among the top 100, but several are growing fast and could be there within a decade as private enterprise responds to the growing need for lifelong learning. Finally, any analysis of capital structure should recognize that most balance sheets are dramatically inaccurate because (with the exception of professional sports franchises) they fail to include the value of human capital. Gary Becker, the Nobel Prize-winning economist, calculates that human capital — the knowledge, skills, experience and earning power of people — accounts for more than three quarters of the asset value on the national balance sheet. It may sound like a platitude to say that people are the most important asset, but in fact they are. The market capitalization of many companies has changed by billions of dollars within hours of a change in CEOs. And with good reason. The right leader can make or break a company. With every passing year, however, the people at every organizational level grow in importance. In the 1920s, when automobiles became a huge industry, 60 percent of the cost of producing a car was in raw materials and energy. For today's computer chips, it's less than two percent of the cost. Brainpower has become the "raw material" for building companies. This human capital, combined with the social capital of democracy, open markets and the rule of law - is the basis of a prosperous economy. Ultimately, the importance of finance in society lies in its ability to unlock the potential in people. Back in the 1960s, many students at the University of California, Berkeley, wanted to change society. "Unlike other crusaders from Berkeley," I wrote a few years later, "I have chosen Wall Street as my battleground for improving society because it is here that government institutions and industries are financed." My first talk to the Wall Street community suggested that the best investors are social scientists. Such investors see beyond financial statements and physical assets to the changing needs and tastes of people. They respond to the opportunities created by change. In doing so, they create value for society. The opening of our capital markets to people of broader backgrounds over the last 30 years has allowed far more individuals with a dream to test themselves in the marketplace. That has strengthened our economy to be sure. Equally as important, it has strengthened our democracy. Michael Milken, one of America's leading philanthropists, is often said to have revolutionized modern capital markets, making them more democratic by expanding access to capital. This created millions of jobs. He co-founded the Milken Family Foundation in 1982 and now heads FasterCures / The Center for Accelerating Medical Solutions, the Milken Institute, and the Prostate Cancer Foundation. Mike also helped launch the Melanoma Research Alliance. He and his wife, who were married in 1968, have three children and 10 grandchildren.